Gru is a moderately successful super-villain. He has designs on stealing the moon, but to do so he needs to get a shrink ray which is kept safe in the lair of Vector, a rival super-villain. Gru cannot access it, but notices that three orphan girls are able to walk into Vector’s lair to sell cookies. Gru quickly adopts the girls, and steals the shrink ray while the girls are busy transacting their cookie sale with Vector. 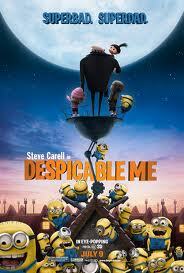 Gru begins to care about the girls, but returns them to the orphanage in order to focus on his criminal career. He quickly changes his mind and re-claims them. The story of Gru and crew is not without strength (making a children's book about your family is a great idea), but overall, this movie’s got lots of adoption problems. Margo, Edith, and Agnes are three young girls living at Miss Hattie’s orphanage. They very much want to be adopted. Gru adopts them, returns them, and takes them again. He writes a kid’s book for them to express his grief at returning them and to declare his permanent love for them. We are given good insight into Gru’s development into a villain. His mother was very negative towards him, encouraged him to do wrong, and did not share in his dreams. The film creatively shows how this has shaped him. We’re all influenced by our upbringings. 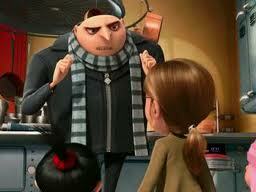 Eventually, though, Gru chooses to do good and his mother commends him. Miss Hattie is horrible. Most kids waiting to be adopted live in foster homes; some live in group homes, but Miss Hattie is abusive. She is cruel – she tells the kids they will never be adopted, forces children to sit in a filthy cardboard “Box of Shame,” and requires children to go unaccompanied into the city to sell cookies to fund her work. She’s as bad as an adoption agent as she is as an orphanage director. When Gru applies to adopt Margo, Edith and Agnes, Hattie never visits his home, meets him only briefly, appears bored and condescending, disbelieves his claims, fails to verify his employment, and yet still approves him to adopt Margo, Edith, and Agnes before the girls have even met him. When Hattie is told that Gru wishes to return the girls, she quickly comes to his house and picks them up, without any questions. She has the girls spend their first hours back at the group home in the Box of Shame. Gru’s relationship with the girls is problematic, too. When Gru first adopts the kids, he is cold and distant from them. He retracts from contact, lies to them, exposes them to danger, and expects them to eat, drink, and toilet on the floor. He sets unrealistic rules. He refuses to play with them. When Margo tells him that he will never be her dad, he is unbothered. 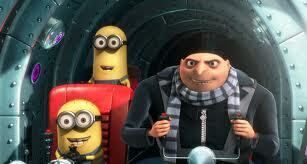 Later, Gru starts to enjoy the girls when they spend time at an amusement park together. His mother starts to connect with the girls. He lets pictures of the girls be added to a family tree collage. And then he bends to pressure from a colleague in crime to let the girls be returned to the orphanage. He lets the girls’ pictures be erased from the family tree. Gru has another change of mind and tries to reconnect with the girls. He shows up very late at a dance hall where they were hoping he would attend their ballet recital and finds that they have been kidnapped. To his credit, he tries to rescue them. During the rescue Margo needs to jump to safety. 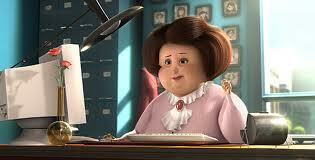 She needs to trust Gru to catch her, and she struggles to trust him because he recently abandoned her. She eventually jumps to him. The scene is reminiscent of a scene in The Martian Child, where a boy on a high ledge has to trust his foster father to keep him safe. In The Martian Child, the boy responds to a heartfelt plea by the foster father. 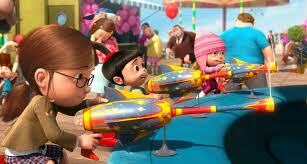 In Despicable Me, it feels shallower and contrived. Gru’s relationship to the girls feels like one of convenience and whim. He says he will never let her go again – but we have no reason to believe him. Gru closes by reading the girls a bedtime story he wrote for them – basically saying that he loves them and they changed his heart. But even that bedtime story is more about Gru’s feelings than anything else. The movie ends with the girls giving Gru and his mother a private ballet recital, to make up for the one he missed. 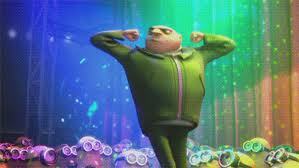 In typical Gru-centric fashion, the recital is changed into a techno dance featuring Gru. Miss Hattie never shows up again. I wonder if she even knows the girls were kidnapped from their dance recital? If you do see this movie, there are some questions to process with your kids. There’s an activity that you can do even without watching the movie. Gru was not dependable to the girls. How can they know whether he is trustworthy now? How does Miss Hattie’s place compare to places you’ve lived? Use card stock or a nice notebook to write a kid’s book describing your family and how it came to be. Let your kids help with writing and illustrating it. Read it often. I saw this movie a while back and found it incredibly funny but you are so right - it has tons of issues!